The thing about promises is that if you keep the important ones, you'll probably be forgiven for breaking the little ones. Though the new Broadway production of the Burt Bacharach-Hal David-Neil Simon musical Promises, Promises and its cast recording are not perfect, whatever relatively minor flaws exist are easy to overlook in light of the overall achievement. For those of you who are unfamiliar with Promises, it's based on the film The Apartment and is set in the 1960s -- a time when the idea of high-powered business execs cheating on their wives and sleeping with their co-workers could be treated comically (in the case of the secondary characters) as well as seriously (in regard to the leads). I've always thought the musical might be retitled How to Succeed in Business By Lending Your Apartment to Higher-Ups in Your Company So They'll Have a Place to Screw Their Mistresses. By current standards of sexual politics, it's all rather unseemly, but it ultimately works because we do get to see the unfortunate consequences of such behavior. As heard at the Broadway Theatre and on the new CD available from Sony Masterworks Broadway, Sean Hayes does a stellar job with the songs that Bacharach and David wrote for the central character, C.C. "Chuck" Baxter. Hayes's voice has a quick, tight vibrato (I believe "lamb's bleat" is the common term) that might take a little getting used to for some listeners but is really quite pleasant and very musical. As Chuck's beloved, Fran Kubelik, Kristin Chenoweth is somewhat miscast in terms of age and type, but that doesn't come across on the recording. What we get here are wonderfully soulful renditions of "Knowing When to Leave," "Whoever You Are," and several other songs, including two interpolations (see below). Tony Goldwyn is spot-on as J.D. Sheldrake, the executive with whom Fran is carrying on an affair. Not previously known for musical roles, he sings with inflections that call to mind the mid-career Frank Sinatra, a good role model for this character. Tony Award winner Katie Finneran is a riot as the soused and horny Marge MacDougall, whose attempt to pick up our friend Chuck in a bar -- in the course of the tipsily delightful number "A Fact Can Be a Beautiful Thing" -- doesn't turn out as she had hoped. Brooks Ashmankas, Sean Martin Hingston, Ken Land, and Peter Benson as four philandering executives make a strong case for the sort of funny but also kind of creepy "Where Can You Take a Girl?" Hearing the score again, I was struck by the fact that Bacharach's music is far superior to David's lyrics. From the thrilling overture through the unforgettable title song, Bacharach fills our ears with delicious melodies, harmonies, and rhythms, whereas David's work is often pedestrian, clumsy, and overly repetitious. One example: In "Wanting Things," David has Sheldrake sing, "When will I learn to resist wanting things, touching things that say 'do, do not touch.'" You see, he needed to fill an extra beat of music; but instead of giving the matter a few moments' thought and coming up with "touching things, things that say 'do not touch,'" or maybe "touching things that say 'please do not touch,'" he nonsensically repeated the word "do" and gave us doo-doo. The show is still a winner on the whole because the music and the book are pretty great and because David sometimes managed to rise to the occasion, as in the two most famous numbers from the score: "I'll Never Fall in Love Again" and the title song. But I can't help wondering how much better Promises would be if Bacharach had collaborated with a skilled Broadway lyricist rather than sticking with his pop song writing partner, who was not quite up to the task. But I'm gonna go out on a limb and say that adding "I Say a Little Prayer" was not in itself a bad idea, because it does serve the valuable purpose of giving Fran a musical moment in which she's happy -- or, at least, thinks she's happy. It also points up her obsession with Sheldrake and neatly foreshadows the end of their relationship ("To live without you would only mean heartbreak for me"). A little more work should have been done to seamlessly insert the song into the show; as is, it doesn't function well in context because there's no emotional transition to Fran's first big scene with her paramour, where she's terribly hurt and frustrated over the affair. But this isn't an issue on the recording, so one can sit back and enjoy Chenoweth's scintillating performance with spiffy female-ensemble backing. Phil Reno conducts an exciting performance that features Jonathan Tunick's own savvy revisions of his original orchestrations, complete with those fabulous '60s "orchestra voices." I personally prefer the original version of the overture, but this one is not bad -- and what matters most is that those first few, thrilling bars are intact. Overall, Sony's new recording of this groundbreaking score is a winner. P.S. If you're waiting for some label to release the original London cast recording of Promises, starring Tony Roberts and Betty Buckley, don't hold your breath. Apparently, there are major licensing problems. Too bad, because while that album has its own set of flaws, it also has its pluses, and it's a better-mixed recording of Jonathan Tunick's original orchestrations than the OBC. P.P.S. 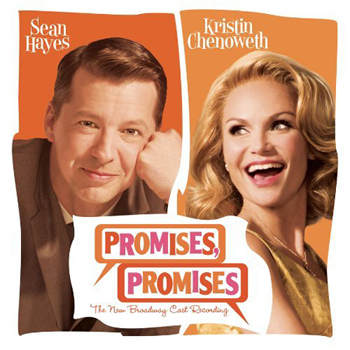 If you want to check out something really exotic but quite wonderful, try to get your hands on the 2002 Italian cast recording of Promises, Promises -- pardon me, Promesse, Promesse. A friend gave me a copy of the disc with no accompanying booklet, so I can't give you the names of the cast or anyone else involved. But it's a fabulous performance of the score with a charming Chuck, a lovely Fran, and a nifty adaptation of the Tunick orchestrations. (I have no idea if he did the job himself.) Viva Italia! P.P.P.S. If you don't already own the OBC, now is an excellent time to purchase it: Kritzerland is coming out with a new two-disc set that contains the album as originally mixed plus a remixed version which, we are promised (! ), corrects the often pitchy singing of several of the principals. (Apparently, it was a rough recording session.) My suggestion is, pounce.